Quad-core goodness in a slim, swiveling design. Dell's Inspiron 13 5000 2-in-1 may be a modest cousin to the company's flagship XPS 13, but for a much more affordable price it delivers quad-core performance in a slender shell—a impossible trick merely a year ago. Despite our review unit's so-so battery life and dim 13-inch display, the Inspiron 5000’s brisk performance, reasonable price and tablet-morphing abilities make it a compelling—and powerful—mid-range ultrabook. As usual for Dell, the Inspiron 13 5000 model we tested (officially the Inspiron 13 5379) comes in many flavors. We reviewed the $730 version, with a quad-core Intel Core i5-8250U processor, a 256GB solid-state drive, and 8GB of DDR4 RAM. A version that differs only in its 1TB hard drive (a performance downgrade) was selling for $620 on Amazon at presstime. You can spend as little as $529 on a step-down model with a dual-core Pentium 4415U processor, 4GB of RAM and a 1TB hard drive. Going the other way, you could pony up $999 for the top-of-the-line Core i7-8550U version with 16GB of RAM, 512GB SSD, and a Windows Ink-compatible display. Weighing in at about 3.5 pounds, the 12.8 x 8.9 x 0.8-inch Inspiron 13 5000 feels a tad heavy for a laptop with a 13-inch display. That said, the Inspiron 13 5000 gives you a bonus in exchange for the extra weight: a touch display with a 360-degree hinge. Among the possibilities: you can swivel the display all the way around to turn the Inspiron 13 into a (heavy) tablet, tilt the screen back with the keyboard face-down, or even “tent” the laptop in an upside-down V shape. 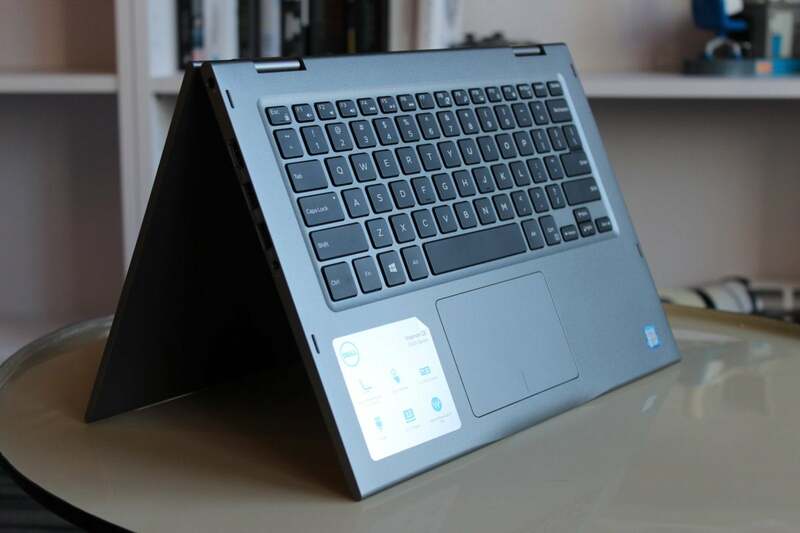 The Dell Inspiron 13 5000 sports a 360-degree hinge for use at many angles. Nifty stuff, but the real magic sits under the Inspiron 13 5000’s hood. Thanks to its 8th-generation Intel Core i5-8250U processor (Kaby Lake Refresh), the Inspiron 13 5000 is among the first ultraportables to boast true quad-core performance. As you’ll see in a moment—spoiler alert!—the benchmark results don’t disappoint. The Inspiron 13 5000 also comes with an integrated Intel UHD Graphics 620 Core. Despite Intel’s new “UHD” label, it delivers essentially the same ho-hum performance as the prior generation's Intel HD 620, better suited for everyday productivity tasks than for gaming. The Inspiron 13 5000’s 13-inch IPS display works adequately, but its drawbacks represent one of the bigger sacrifices made to hit an affordable price point. The 1920x1080 resolution is reasonably sharp, and the viewing angles are decent (the screen starts to fade beginning at about 30 degrees or so from center). According to our measurements, the Inspiron 13’s display maxes out at 208 nits (or candelas), far below the minimum 250 nits we prefer. Sure, you can still read charts and Word documents while viewing the screen indoors, but you won’t be able to crank the brightness much if you take the Inspiron out in the bright sun. The Dell Inspiron 13 5000's keyboard feels solid, and the trackpad is fairly responsive, if a bit hard to click. The Inspiron 13 5000’s backlit keyboard felt good to my fingertips, with nicely spaced keys that boast solid travel and clickiness. While I wasn’t surprised by the lack of a numeric keypad (this is a 13-inch laptop, after all), I was a bit bummed by the paltry number of Windows hotkeys: just search, monitor options, menu, and an airplane mode toggle. Meanwhile, the Inspiron’s trackpad feels roomy and accurate, although I wish it took a little less pressure to click. Located on the bottom of the laptop’s chassis, the Inspiron’s stereo speakers sounded (surprise!) mediocre at best. From the first movement of Haydn’s 88th Symphony to “Live and Let Die” by Paul McCartney and Wings, tunes sounded flat and almost entirely bass-free. Also, the speakers aren’t all that loud, even with the volume cranked all the way up. Positioned directly above the display, the Inspiron 13 5000’s 720p webcam will do the trick for video chatters, capturing smooth if somewhat grainy and washed-out video. Much better is the nearby Windows Hello-compatible infrared camera, which lets you log into Windows simply by glancing at the screen. Once I let Windows scan my face a few times, the Inspiron had little trouble recognizing me—even in the dark. Within a few moments of looking at the screen, I was back at my Windows desktop. The laptop did lock me out when I donned a pair of sunglasses, but a few glasses-on practice runs solved that problem. The left side of the Dell Inspiron 13 5000 houses full HDMI and two USB-A ports. 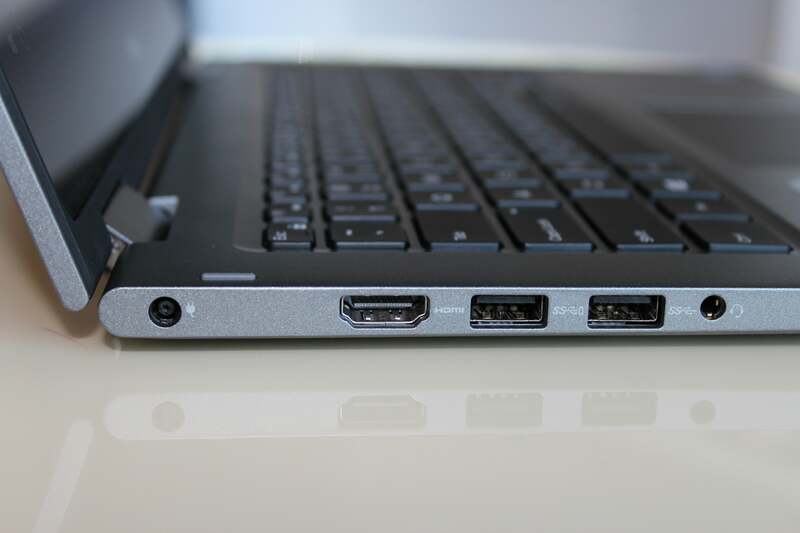 On the left side of the Inspiron 13 5000, you’ll find an HDMI port, a pair of USB 3.1 Gen 1 ports, and a headphone jack. On the right sits a USB 2.0 port and an SD card reader. While we wouldn’t have minded a Thunderbolt port, mini-DisplayPort, VGA or ethernet, it’s no surprise that Dell skipped them given the Inspiron’s slim design. Also on the left side of the laptop is a slim power button and a volume rocker. 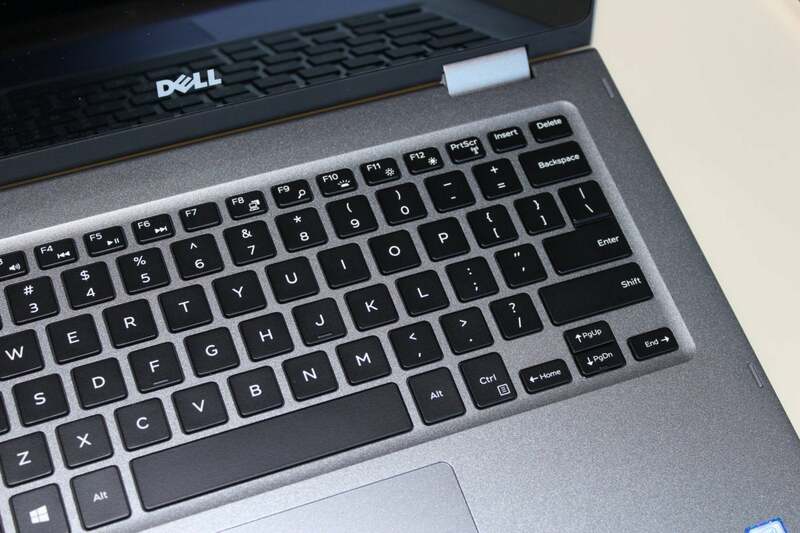 While the volume control is easy to find with your fingertip, the power button is flush with the edge of the Inspiron’s shell, making it tricky to find by touch (although you’d probably get the hang of it in time). 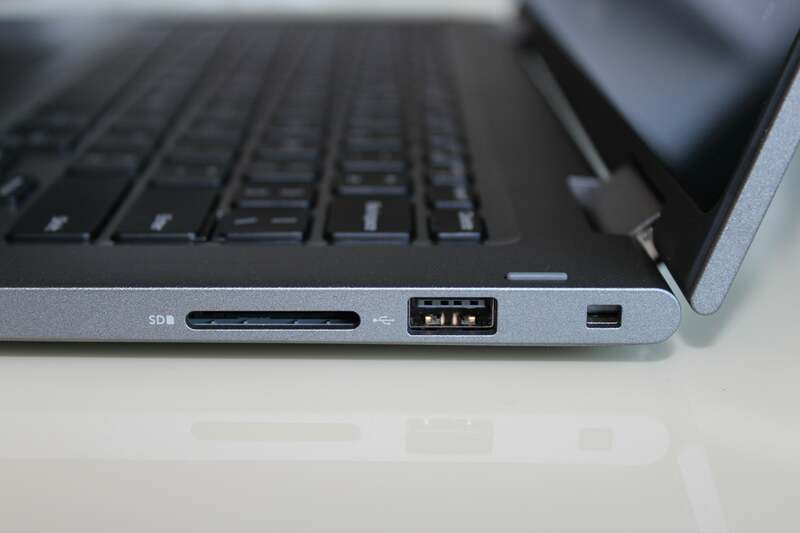 The right side of the Dell Inspiron 13 5000 houses an SD card slot and another USB-A port (this one is USB 2.0). With its 8th-generation, quad-core i5-8250U processor, the Inspiron 13 5000 racked up some impressive numbers in our benchmark tests, breezing through tasks that dual-core ultrabooks (which, until now, were pretty much all we had) labor to finish. We compared it to other Kaby Lake Refresh laptops we've tested, all of which cost many hundreds more. They include Dell's own XPS 13 flagship, HP's Spectre x360 13T, and Lenovo's Yoga 920 (which we're still reviewing). We also threw in a slightly older, 15-inch Asus VivoBook 5. It has a 7th-generation CPU (and it shows in the results), but it costs about the same as our Inspiron 13 5000 review unit. While it’s not a great showcase for quad-core performance, our PCMark 8 Work Conventional benchmark gives us a good idea of how a system will perform when it comes to everyday desktop and web browsing tasks. Any score above 2,000 means you’ll be cranking through Office documents without skipping a beat. The Dell Inspiron 13 5000 sticks with the pack of 8th-gen, quad-core Kaby Lake parts in this CPU-intensive test. The lone dual-core Skylake, the Asus VivoBook 5, takes noticeably longer to complete the test. The quad-core Inspiron 13 5000 clears the bar easily, although it’s worth noting that plenty of cheaper, dual-core ultrabooks can ace the PCMark 8 Work test, too. If you’re only planning on using a new laptop for Office and web browsing, a quad-core laptop like the Inspiron 13 5000 might be overkill. Our HandBrake benchmark, a CPU-taxing test that involves encoding a 30GB MKV video file, presents a more interesting challenge. 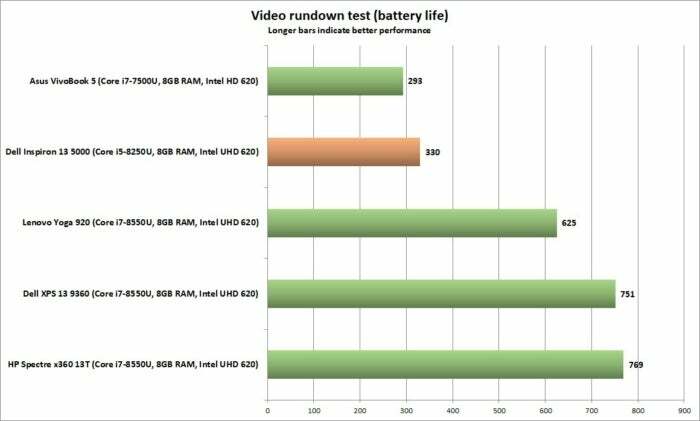 Even the fastest dual-core laptops can take up to two hours to complete the HandBrake test, while quad-core laptops—which, up until now, have been too big and heavy to qualify as ultra-portables—can often cut that time in half. I was eager to see how the thin and light Inspiron 5000 would measure up. 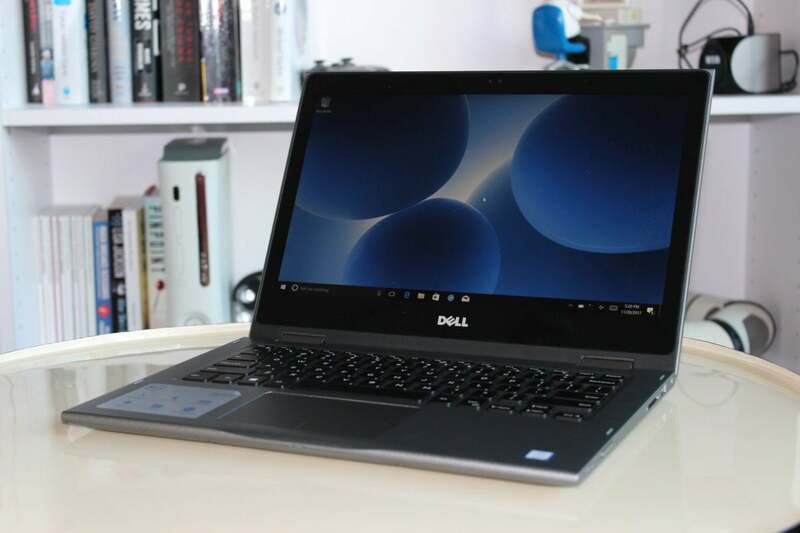 With its HandBrake score of 4,117 (about one hour and eight minutes), the quad-core Inspiron turns in a speedy performance, slightly slower than the Dell XPS 13 but still much faster than dual-core competitors like the Asus VivoBook 5. A relentless test like HandBrake can also show you how a laptop handles its thermals. We noticed that the bottom of the Inspiron’s case heated up noticeably during the test, and its fans whirred to life. After a brief burst to 3.4GHz, its processor settled down to a cruising speed of 2.2GHz. 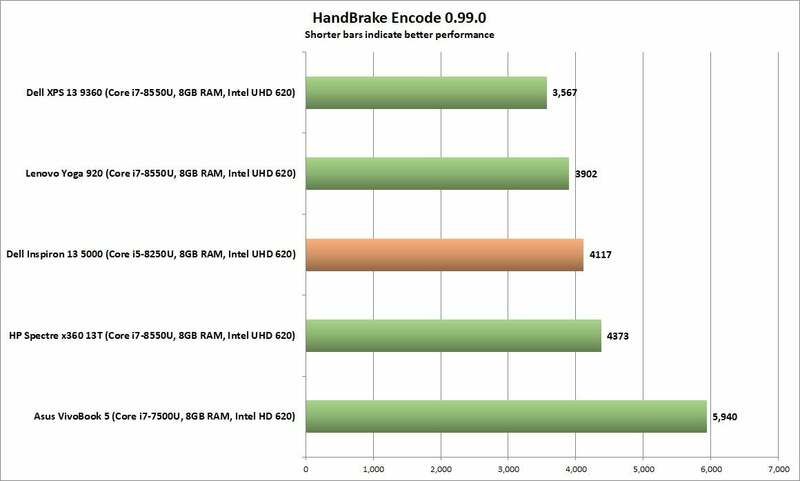 In other words, the quad-core Inspiron managed to power through the HandBrake test without melting its thin chassis. 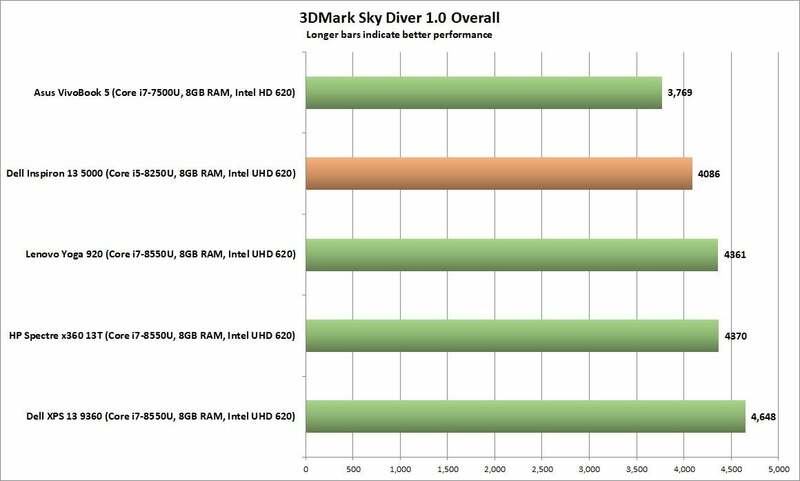 When the Dell Inspiron 13 5000 shares the same Intel integrated graphics as the other laptops shown, they'll perform fairly closely in the GPU-focused 3DMark Sky Diver. 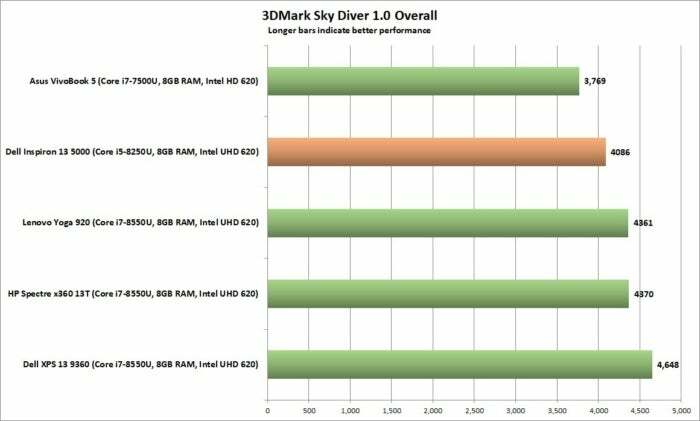 As it lacks a discrete graphic chip, the Intel UHD Graphics 620-powered Inspiron 13 5000 won’t be your go-to mobile gaming machine, a fact that’s reflected in the laptop’s good-but-not-great Sky Diver score of 4086—slightly ahead of the pack when it comes to dual-core slim-and-lights, but a bit behind the new Dell XPS 13 (which comes with the same Intel integrated graphics core as the Inspiron). To test a laptop’s battery life, we load up a 10-minute 4K video file and loop it using the native Windows 10 Movies & TV player. Normally, we set the laptop’s brightness up to at least 250 nits, although in the Inspiron 5000’s case, maxing out the display at 208 nits was the best we could do. We also keep the volume on halfway with headphones plugged in. The Dell Inspiron 13 5000's smaller battery simply can't last long in our video rundown test. Its time hews closely to that of the Asus VivoBook 5, which also has a smaller battery. The result? After a series of three battery rundowns, we got an average of 330 minutes from the Inspiron's 3-cell 42WHr battery, or about five and a half hours of battery life. That’s in line with what we’ve seen from laptops with similar battery capacity (like the Asus VivoBook 5). Depending how you use the Inspiron, five-plus hours might be all you need. Just don’t expect all-day battery life here. Despite our review unit's so-so battery life and dim display, the Inspiron 5000’s brisk performance, reasonable price and tablet-morphing abilities make it a compelling—and powerful—mid-range ultrabook.